Lottie is the new buddy for Pooh! The silly old bear with a great soft heart and a big tummy is now back in the latest release of “Return to the Hundred Acre Wood” penned by David Benedictus and illustrated by Mark Burgess. 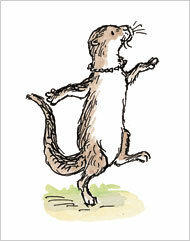 After getting the green signal from the Pooh trustees, Winnie the Pooh bear has got a new chum; Lottie, the Otter, a charming and pretty female who exemplifies Miss Attitude. The cartoon world is excited with the new entry of this spicy character who loves to wear pearls and wants everyone to follow the rules of life as she does. Wondering what would be its influence on our lovely, rumbly-tumbly Pooh? Well, there lies the real fun. The amazing introduction of Lottie includes enthralling activities like a swim in Robin’s bath and her great craze for cricket which is sure to attract readers from every age-group. The long awaited book, which has kept its lovers waiting for over 80-years, it to be released in October. It occurred to the writer of the book around 20-years ago that bringing out a sequel to the first ever written book on Pooh is not such a bad idea. Thanks to his interest, and the reception from the native and foreign English publishers, the Chairman of Pooh trustees, gifted to the world a brand new, yet interesting and laugh-a-minute book circling around our hero, Pooh! The author has succeeded in maintaining excitement till the last page of the book and has not failed to maintain the tone of the writer of the first book and the father of the fluffy bear.